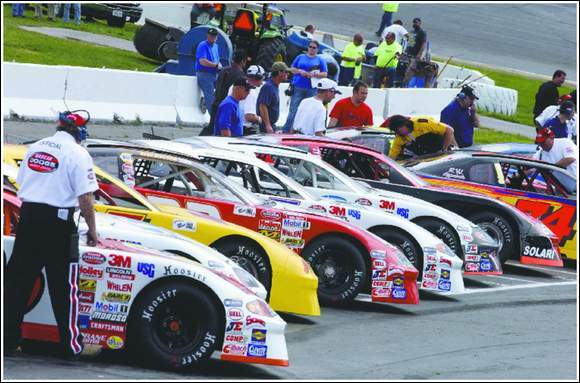 (August 12, 2006) In one of the wildest and craziest Havoline Western Late Model races of the season, Stockton’s Pete Anderson Jr. scored his second straight win and fourth of the season at Stockton 99 Speedway on Saturday night. Starting from the pole, Anderson looked to be invincible as he rocketed to the lead and began to run away and hide from the rest of the field. Events took a sudden and dramatic turn after a yellow caution popped out on lap 23. Anderson and Ron Strmiska Jr., of Stockton, played cat and mouse as they jockeyed for position to take the green flag to restart the race, but after a couple of false starts, flagman Mark Vincelet tired of their antics and ordered the pair to the back of the pack. It seemed as though just about every car in the race took a turn up front during the next few laps as the entire field continuously recycled while Anderson and Strmiska doggedly battled their way back. Anderson reassumed the lead on lap 30, but his problems were not over yet as he developed a slow leak in his left front tire with about ten laps remaining in the 50-lap feature. Anderson was barely able to hold on as Strmiska continuous applied pressure until the checkered flag came out to conclude the race. "Every start Pete had a big jump and I wasn’t going to let him get away with it. I was surprised when they sent us to the back," said Strmiska. "We both had good cars and I think if I could have gotten in front he would have a hard time getting by me. I guess you have to be happy with second." "Typical 99 race. Going to the back was just a minor setback," said Anderson, who entered the night second in both the regular season and special HOTWOOD point standings. "I’ve had a good car lately, but I have been frustrated since I got stuffed into the fence and lost the points lead a couple of weeks ago, so it is pretty much either win or wreck the rest of the year." Former two-time track champion David Philpott, of Tracy, turned in his best performance of the season by placing third while and Joey Stearns and Danny Contessotto, both of Stockton, rounded out the top five. Havoline Western Late Model season point’s leader Guy Guibor, of Manteca, struggled the entire night. Guibor wound up in seventh after making two trips to the back of the pack, once voluntarily after going to the pits to repair a flat tire and again on lap 46, at the invite of the officials, for spinning Sacramento’s Pete Hernandez. "It was just a bad night," said Guibor. "We’ll get it all fixed up and be ready to go next week." A pre race invert draw of 12 made for a very explosive mixture when the 20-car American Limited Stock Car (ALSC) field barreled down the front straightaway to take the green flag to start their 30-lap feature. With multiple instances of three-wide racing, numerous lead changes and a couple of grinding wrecks, the race did not disappoint anyone in attendance. When the smoke finally cleared, seven yellow caution periods later, Escalon’s Darrell Hughes, who was the night’s fast qualifier, had his second victory of the year. "I thought I was dead, that I didn’t have a chance, when I heard the draw was 12 tonight," said Hughes as he celebrated his win with his family. "I figured if I took my time with all the traffic I might be able to get into the top five, but I never thought I could get up to the front." Stockton’s #85, Pete Anderson Sr., who made several late race attempts to get by Hughes, settled for second and Stockton’s Donny Darter had his two race win streak come to an end with a third place finish. Darter’s finish was still impressive considering he was sent to the back of the field for spinning Stockton’s Joe Allen on lap 12. ALSC points leader #75, Chad "the Iceman" Holman of Stockton finished the race in seventh to protect his lead, which was 79 points over Hughes, at the start of the night. Lathrop’s Mark Henslee picked up his sixth win of the season in the 11-truck Pro-4 Truck feature. Ron Robeck of Milpitas and Eric Figone of Stockton rounded out the top three in the 30-lap main, although Robeck was later disqualified when he failed the post race tech inspection. The young drivers of the future in the WSRA MiniCups and Baby Grands made their final appearance ever at the 99 Speedway, which will close following the 2006 season. Before the night’s proceedings began officials from the WSRA MiniCup division presented Stockton 99 Speedway promoter Ken Clapp with a trophy and poster, signed by all the drivers, for his support and commitment to the series over the years. Jarrett Kelly, age 11 of Lincoln, pulled the upset of the night by taking the checkered flag in the 20-lap MiniCup race for his first victory in the series. Manteca’s Jacob Gomes, age 13, entered the night with 12 straight wins at Stockton and an amazing 24 victories in his last 25 races dating back through 2005, but despite a valiant effort, he was unable to catch Kelly and was forced to settle for an unaccustomed second place. Shane Lawrence, of Galt, finished third to complete the podium for the 18-car MiniCup feature. Rio Linda’s Johnathan Hale relentlessly nipped at the heels of Tracy’s Mike Conti for 18 laps before he was finally able to squeeze by Conti for the lead in the 10-car Baby Grand feature. Once Hale grabbed the top spot there was no looking back as he cruised to an impressive win in the 30-lap Baby Grand feature. The special Kid’s Night program, organized by Linda Jones and presented by J.M. Environmental, kicked off the evening’s entertainment as over 40 kids competed on the front straightaway in various tricycle events. The evening concluded with a bone jarring, smash ‘em up destruction derby, presented by Power Trip Xtreme Energy Drink, that had the crowd of better than 3,600 roaring with excitement throughout the entire contest. Hometown derby legend Joe Reyes, age 63, survived the carnage to take top honors. "I have been to hundreds of derbies, but I haven’t been on asphalt in about ten years. I loved it," said Reyes, who has been competing in derbies for better than 44 years. "I have won just about everywhere, but I really wanted to win in Stockton because it is my hometown." 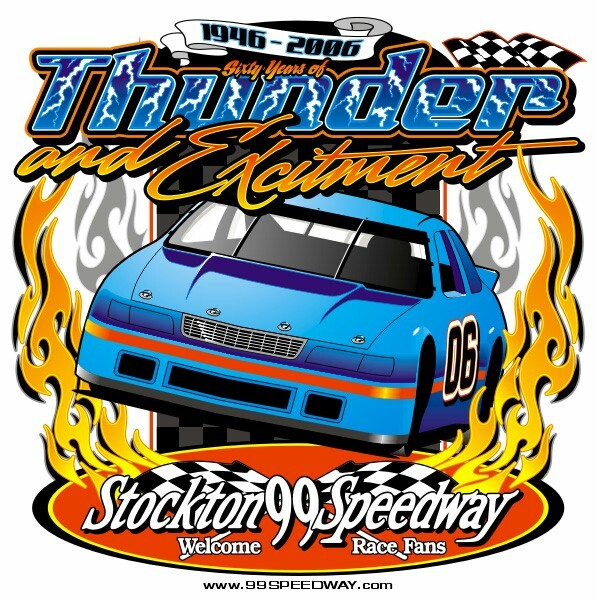 The Stockton 99 Speedway will return to action next Saturday night, August 19, with a four division NASCAR Dodge Weekly Racing Series program that includes the Western Late Models in a special 100-lap feature, Grand American Modifieds, American Limited Stock Cars, Pro-4 Trucks, presented by Havoline/C.L. Bryant.